I love it! The owls, the stories, the hammock (Mark calls these kind "cheese graters")the shadow, very cool! Thinking of you. Very busy this weekend....will tell you all about it later. Love! Freedom is something I value most in my life. I am always seeking it...always looking for the open window. Maybe I was a cat in a previous life? what a brilliant beginning to my sunday! 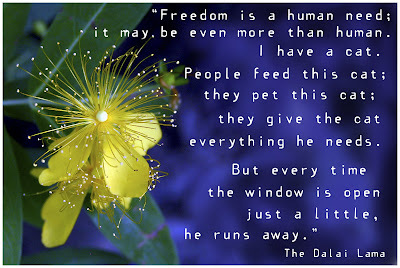 the colors of blue and yellow and then the wisdom of the dali lama which often leaves me chagrinned. good morning sunshine! it's later in your neck of the woods but still morning i am guessing. tell me did you find the book of 100 ghosts yet??? i am hoping you have and will pass it along to me. Christy, Jaime, Robin, Polona - One of my favorite quotes. Michael quoted it to me as we were giving Maggie her injection yesterday & she was wriggling to get away. Oh, and Robin - the book is "The Ten Thousand Things" by Maria Dermout, with one of those little things over the u in her last name. :) I'll email you a link to it. It's a Dutch book about Indonesia.